A weekend of celebration called for a special celebratory cake to mark my Aunt and Uncles 20th wedding anniversary. Last night we all had a fantastic family get together eating and drinking on the outside deck til the early hours of the morning. Nothing beats an Irish heatwave! Carrot cake is very popular amongst my family and is treat we all associate with Summer holidays at the Clare seaside in Kilkee. So this 'Love Birds' cake is a delicious Carrot Cake topped with cream cheese frosting. 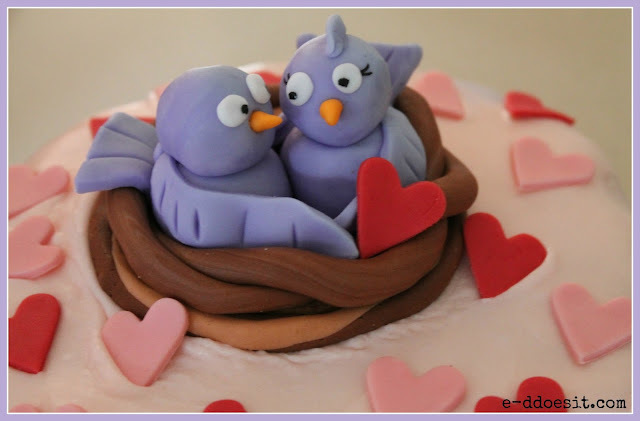 I wanted a romantic theme for this cake obviously, so these cute nesting love birds seemed very appropriate. I built the birds nest around a digestive biscuit to make it easier to transfer onto the cake. For the nest I simply rolled out long, thin sausage shapes and entwined them around each other to create a 'woody' look. Icing your board really makes your cake stand out all the more. The red fondant icing I have used was bought pre-coloured in a 2.5kg bag. As I have discussed before red roll out icing would break your heart if you were trying to colour it by hand, using white fondant and red food colouring. Save yourself the heart ache and pick up a pre-coloured pack. I also coloured the cream cheese frosting with a dash of 'Wilton Rose Food Colouring' to bring the colour scheme together, but a little goes a long way so add a minuscule amount at a time until you achieve the pale pink colour you want. and I divide my cake in half lengthways and fill the centre with frosting. 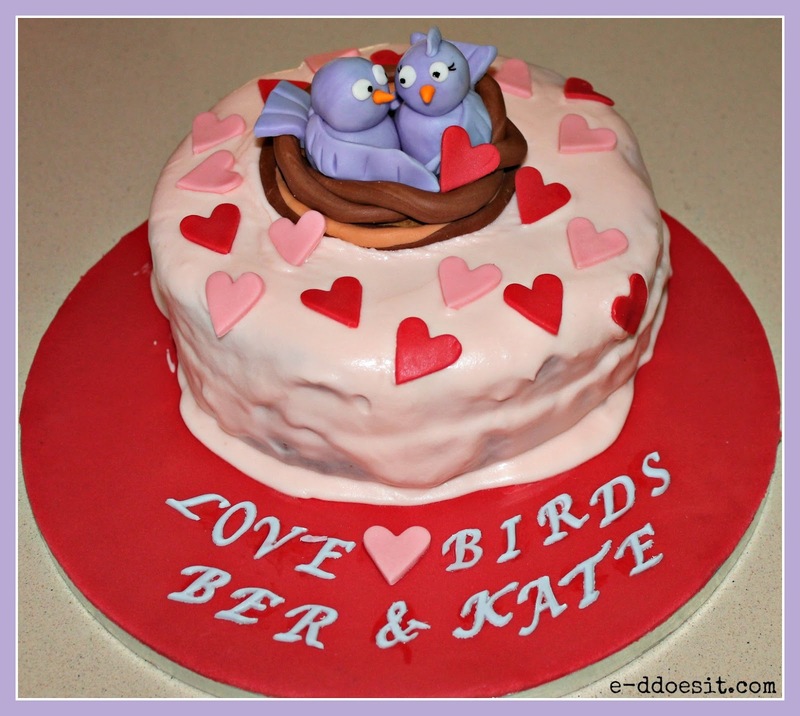 - A very Happy 20th Wedding Anniversary to Kate & Ber, here is to 20 more! 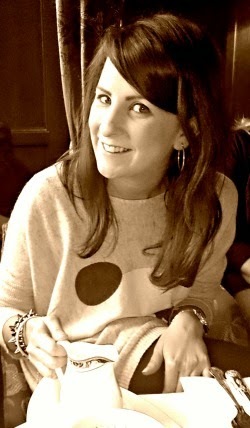 I went to Kilkee every year for my summer holidays when I was growing up. My sister learned to walk there! Ha Marian that's so funny! I love Kilkee, all my family still go for a week each summer for a week! You need to make a little trip back to the wild wild west! The cake looks great! I bet the couple were very pleased. I love how fondant adds such a wow factor but is relatively easy to use.